Paired for the first time with crew chief Chad Knaus, sophomore driver William Byron put his No. 24 Chevrolet Camaro ZL1 on the pole for the Feb. 17 Daytona 500 on Sunday (2:30 p.m. ET on FOX, MRN and SiriusXM NASCAR Radio), leading a Hendrick Motorsports sweep of the top four spots and extending that organization’s dominance in Monster Energy NASCAR Cup Series qualifying at Daytona International Speedway. Byron edged last year’s pole winner, Alex Bowman, by .036 seconds for the top starting spot in the 61st running of NASCAR’s most prestigious race with a lap at 194.305 seconds (46.319 seconds) in the final round of knockout qualifying. Bowman’s lap at 194.154 seconds knocked seven-time series champion Jimmie Johnson (193.807 mph) off the front row for the 500. Johnson, in turn, beat two-time Daytona 500 pole winner Chase Elliott (193.782 mph) for the third fastest lap by .006 seconds. 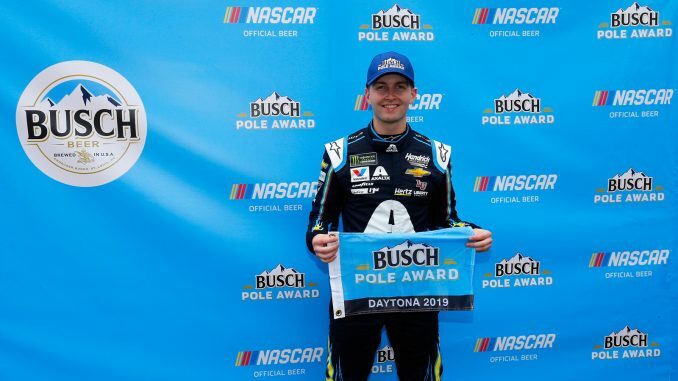 The Busch Pole Award was the first for Byron in 37 tries. The 21-year-old is the eighth driver to contribute to the total of 13 Daytona 500 poles won by Hendrick Motorsports, which won its fifth straight. Only Byron and Bowman are locked into their starting sports for next Sunday’s race. The remaining 38 starting positions will be determined in Thursday night’s Gander RV Duel 150-mile qualifying races (7 p.m. ET on FS1, MRN and SiriusXM NASCAR Radio). 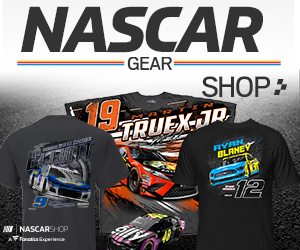 “We felt we were prepared and ready and this was sort of the first step of our process together,” Byron said of his new partnership with Knaus, who moved to the No. 24 car this year after winning seven titles as Johnson’s crew chief. The pole was the 700th for Chevrolet in the Monster Energy NASCAR Cup Series. As fast his car was, Byron acknowledged his lap wasn’t quite perfect. In a session that both establishes the front row for next Sunday and sets the lineups for the Duels, Sunoco Rookie of the Year contender Daniel Hemric qualified fifth in his No. 8 Richard Childress Racing Chevrolet, giving Chevys the top five laps in the final round. Reigning Cup champion Joey Logano was sixth in the fastest Ford—the first competitive outing in the Cup series for the new Mustang—and 2017 champ Martin Truex Jr. was seventh in the quickest Toyota entry. Clint Bowyer, Brad Keselowski, 2018 Daytona 500 winner Austin Dillon, Paul Menard and Denny Hamlin completed the top 12. The last driver to make a qualifying run in the first round, Truex knocked Joe Gibbs Racing teammate Kyle Busch (13th) out of the top 12. Two of the six drivers in open cars—those without charters—locked themselves into the Daytona 500. The first was Tyler Reddick, who was a strong 16th in the first round. The second was Casey Mears, who edged the non-chartered No. 71 Chevrolet of Ryan Truex by .028 seconds for the 26th fastest lap. Truex, Brendan Gaughan (31st), Parker Kligerman (36th) and Joey Gase (42nd) will vie in Thursday night’s Gander RV Duels for the two remaining berths in the Great American Race. 1. (24) William Byron, Chevrolet, 194.305 mph. 2. (88) Alex Bowman, Chevrolet, 194.154 mph. 3. (48) Jimmie Johnson, Chevrolet, 193.807 mph. 4. (9) Chase Elliott, Chevrolet, 193.782 mph. 5. (8) Daniel Hemric #, Chevrolet, 192.460 mph. 6. (22) Joey Logano, Ford, 192.448 mph. 7. (19) Martin Truex Jr., Toyota, 192.353 mph. 8. (14) Clint Bowyer, Ford, 192.291 mph. 9. (2) Brad Keselowski, Ford, 192.263 mph. 10. (3) Austin Dillon, Chevrolet, 191.416 mph. 11. (21) Paul Menard, Ford, 191.107 mph. 12. (11) Denny Hamlin, Toyota, 190.492 mph. 13. (18) Kyle Busch, Toyota, 191.164 mph. 14. (20) Erik Jones, Toyota, 191.127 mph. 15. (4) Kevin Harvick, Ford, 190.957 mph. 16. (31) Tyler Reddick(i), Chevrolet, 190.836 mph. 17. (12) Ryan Blaney, Ford, 190.799 mph. 18. (17) Ricky Stenhouse Jr., Ford, 190.771 mph. 19. (10) Aric Almirola, Ford, 190.739 mph. 20. (41) Daniel Suarez, Ford, 190.698 mph. 21. (1) Kurt Busch, Chevrolet, 190.589 mph. 22. (37) Chris Buescher, Chevrolet, 190.432 mph. 23. (38) David Ragan, Ford, 190.420 mph. 24. (6) Ryan Newman, Ford, 190.018 mph. 25. (34) Michael McDowell, Ford, 189.978 mph. 26. (27) Casey Mears, Chevrolet, 189.849 mph. 27. (71) Ryan Truex(i), Chevrolet, 189.737 mph. 28. (47) Ryan Preece #, Chevrolet, 189.709 mph. 29. (40) Jamie McMurray, Chevrolet, 189.482 mph. 30. (95) Matt DiBenedetto, Toyota, 189.414 mph. 31. (62) Brendan Gaughan(i), Chevrolet, 189.394 mph. 32. (42) Kyle Larson, Chevrolet, 189.215 mph. 33. (43) Bubba Wallace, Chevrolet, 189.191 mph. 34. (13) Ty Dillon, Chevrolet, 188.715 mph. 35. (36) Matt Tifft #, Ford, 188.667 mph. 36. (96) Parker Kligerman(i), Toyota, 188.206 mph. 37. (15) Ross Chastain(i), Chevrolet, 187.899 mph. 38. (00) Landon Cassill, Chevrolet, 187.402 mph. 39. (32) Corey LaJoie, Ford, 185.847 mph. 40. (52) Cody Ware #, Chevrolet, 183.737 mph. 2 drivers failed to qualify. 41. (51) BJ McLeod(i), Chevrolet, 182.682 mph. 42. (66) Joey Gase(i), Toyota, 180.930 mph.